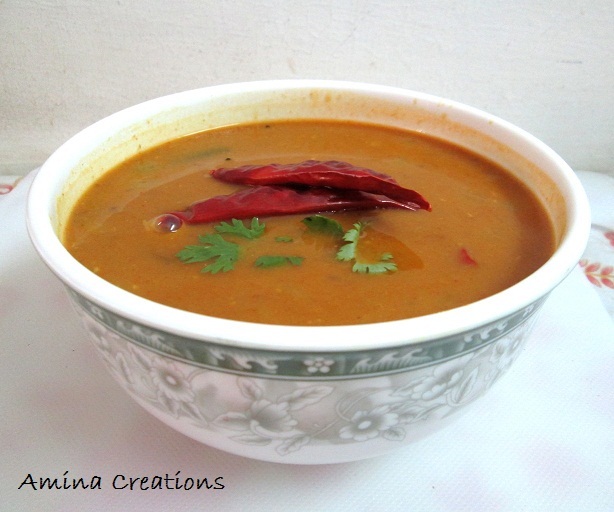 My mother’s Toor dal curry is very delicious and healthy. It tastes best with almost everything, be it rice, roti, idly or dosa. And when combined with omelette and roti it is simply irresistible. It differs slightly from sambar only because of the absence of vegetables. First soak the tamarind in 1 cup of water for 5 minutes. Then wash the tamarind well in the same water and filter it. Wash again with some more water and again filter it. Combine both the filtered tamarind juices and discard the residue. Then take a pressure cooker and add dal, tomatoes, chilli powder, turmeric powder, cumin seeds, and garlic cloves. Add 2 to 3 cups of water and close the lid and cook for about 10 minutes. Remove the lid and add the filtered tamarind juice. Cook for a minute. The dal would have cooked by now. Switch off the gas and allow it to cool. Then transfer the gravy to a mixi and grind it to a fine paste. Remove in a pan and set aside. For the seasoning, heat oil in a frying pan and when oil is hot add mustard seeds and curry leaves. Then add onions and sauté for some time till it turns golden. Then add asafoetida and sambar powder and mix well. Switch off the gas and add the seasoning to the pan containing the dal paste. Add 1 cup of water and salt and bring the gravy to a boil. Cook for about 5 minutes. Toor dal curry is ready to be served.